La Plata County Commissioner Gwen Lachelt works in her office in 2015. Three county residents have filed a petition to recall Lachelt because they are dissatisfied with her lobbying efforts on oil and gas issues, among other issues. La Plata County Commissioner Gwen Lachelt has launched a “Stop the Recall” campaign to persuade county residents to reject an effort by three county residents to oust her from office. The residents, Michael Cugnini, Ty Hawkins and David Peters, object to her work on environmental lobbying, which they say has affected her attendance at county meetings. Last week, they filed a petition to unseat Lachelt, a Democrat. Recall supporters also object to Lachelt’s work with Western Leaders Network, a nonprofit she started to serve as a bipartisan platform for local and state officials to connect on conservation issues. Recall supporters say the work impairs her objectivity on oil and gas issues. Lachelt described her lobbying on environmental issues, such as the Bureau of Land Management’s proposed methane venting and flaring rule, as an effort to set “common sense” regulations for oil and gas drilling and operations. La Plata County staff has verified that Lachelt has never voted against an oil and gas project in the county since she was elected in 2012. According to county records, Lachelt has attended 91 percent of county commission meetings. By comparison, commissioners Brad Blake and Julie Westendorff have attended 95 percent of the meetings. The county tracks attendance only at Board of County Commission and Board of Equalization meetings, not other ancillary meetings commissioners attend, said Megan Graham, county spokeswoman. Lachelt will hold a “Stop the Recall: Decline to Sign” rally at 4 p.m. Feb. 15 at Eno Wine Bar. In an email to The Durango Herald, Lachelt said she is using a campaign website she has had in place since 2012, when she first ran for a seat on the county commission, for her online effort to defeat the recall. Hawkins and Cugnini declined to comment about their recall effort, and Peters did not return calls seeking comment. “When we do say something, it gets turned around 180 degrees. So I’m not willing to comment,” Hawkins said. La Plata County rancher J. Paul Brown said he has not been heavily involved in the recall effort, but he supports it. Brown said he met with Lachelt to talk about updating county land-use codes and the possibility of instituting zoning, but he was unhappy with the discussion. Blake, a Republican, and Westendorff, a Democrat, both oppose the recall effort. “I just don’t think it’s the best for our community,” Blake said. When asked if Lachelt’s lobbying efforts on natural gas and oil issues harms her attendance or interferes with her objectivity in hearing those cases before the county commission, Blake declined to answer, saying the question should be directed at the organizers of the recall effort. Westendorff also opposes the recall effort. “The reality is she was elected a second time, and the second election was an endorsement from the voters that they liked the job she was doing,” Westendorff said. Lachelt first came under scrutiny last summer when a small group of county residents filed an ethics complaint accusing her of having a conflict of interest because of her dual role as a county commissioner and being an employee with Western Leaders Network, an environmental conservation nonprofit. She also accepted paid travel from the Western Leaders Network. A third-party review by the Eagle County Attorney’s Office investigated the allegations. In October, the office found no evidence of wrongdoing. County commissioners were confused about when they should disclose when they are speaking on behalf of themselves or in an official capacity as a county commissioner, or when they accept paid travel. Commissioner Blake ran into the same problem when he accepted paid travel from Trout Unlimited to go to Washington, D.C., in June to speak with the Environmental Protection Agency about funding issues with the recently declared Superfund site north of Silverton. Blake also was cleared by Eagle County’s investigation. In the wake of the complaint, La Plata County is adopting clearer ethics policies, set to take effect this month, based on the Eagle County Attorney’s Office recommendations. Westendorff said when the county revised its ethics policies, it incorporated some of the suggestions of those who registered complaints, and she is surprised the issue is being used by those seeking to recall Lachelt. Lachelt was first elected to a four-year term on the Board of County Commissioners in 2012, beating incumbent Kellie Hotter, a Republican, by a vote of 14,095 to 13,921. 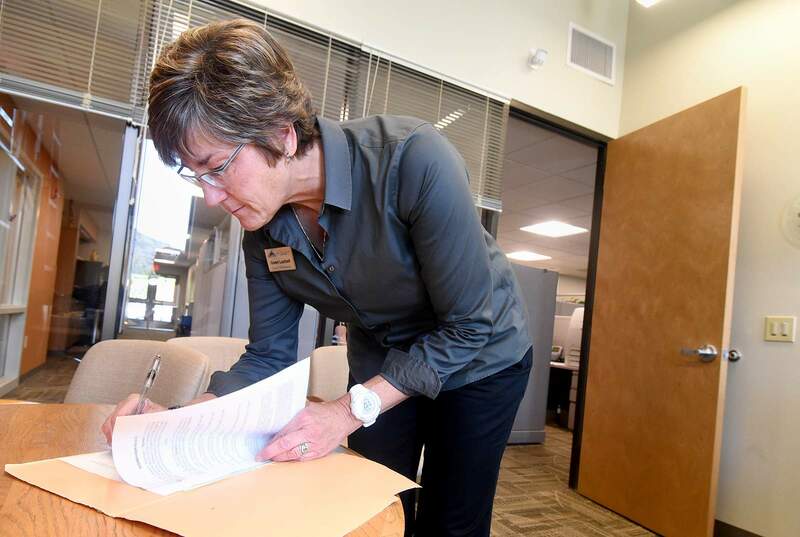 La Plata County Clerk and Recorder Tiffany Parker approved the recall petition against county Commissioner Gwen Lachelt on Monday, which gives recall organizers until March 30 to submit 7,505 valid signatures to send the effort to voters. If petitioners submit the required amount of signatures, Parker has 15 days to verify them. She said the rejection rate is usually high because some people who sign may not be registered to vote or do not properly fill out the petition. As a result, Parker recommends petitioners collect 15 percent more than the required amount. In this case, it would be 8,630 signatures. If the recall petition is successful, Parker said a recall election would likely be set for a Tuesday in July. The date of the vote could slide into August, she said, depending on official protests and legal challenges. If enough signatures are verified, the petition process enters a 15-day period when anyone eligible to vote in the election can file a written protest objecting to the petition or the process of gathering signatures with the county Clerk and Recorder’s Office. Parker then would have 30 days to hold a hearing or designate another person to hold the hearing and rule on the validity of the written protest. Parker said she would normally designate someone else to hold the hearing, as that provides a third-party check on her office’s decisions and work on the recall effort. Then, Lachelt has five days to either submit a letter of opposition or choose to resign. A letter of opposition would send the matter to voters. Parker said a special recall election would cost the county $58,000.